We are deeply skeptical of Shakespeare. Perhaps we have been conditioned by our school experiences. We have been forced to learn his plays. And even though we have been told that he is the world’s best playwright, we suspect that he is overrated and we could write something ten times better if we had the time and motivation. Hasn’t anyone written anything as good since then? Perhaps we have seen a few movies adaptations of his plays, and the language sounds like it came from last century. Hasn’t anyone written anything as good since then? What’s so special about his plays in the first place? If you attend Shakespeare Demystified: The Merry Wives of Windsor, you’ll find out the answer to that last question: the language. The language is beautiful. But wait. As previously mentioned, the language is from the Elizabethan era (in Shakespeare’s case: late 15th–early 16th century). How can we still consider language as old as that “beautiful”? That is a tricky question. As with any playwright, it is impossible to separate Shakespeare’s characters from the language. And his characters may not be the smartest kids in the class. So what makes his characters special? In short, nothing. There is nothing special about Shakespeare’s characters. They do stupid things and they pay the price for it. In the case of The Merry Wives of Windsor, there are many characters who do stupid things. Master Ford thinks his wife is having an affair and one day decides to prove it. In doing so, he unwittingly drives her closer to the act than ever before. But the king of asses is Sir John Falstaff, who schemes to swindle Master Ford and Master Pages’s fortunes, by having affairs with their wives. Mistress Ford and Mistress Page are the merry wives of the title. Mistress Ford is frequently upset because of Master Ford’s jealous rages (the source of much hilarity). She can’t take it and is happy to receive Falstaff’s love letter. Mistress Page is trusted implicity by her husband. She is less than ecstatic with the love letter. When they confide in each other about their love letters, they are quick to guess Falstaff’s true intentions. This sets into motion a series of events that culminate in a Pagan ritual in Windsor Forest. Keep in mind, this version of Merry Wives is abridged. The original play is 3 hours long, and this one is ninety minutes. But it is abridged for a Malaysian audience. The production also targets people who are unfamiliar with Shakespeare. The structure of the play goes like this: scene, explanation, scene, explanation, and so on. After a scene from Merry Wives, we get an explanation of what has happened. At one point, memorably, the actors explain the word “cuckold,” which is pivotal to the ending. I could see why they had to insert these explanations. Shakespeare makes you work for your understanding of his characters. But one of the drawbacks was that this approach took some of the responsibility off of the scene to get the staging right. One of the early scenes between Falstaff and Master Ford gave me this feeling. The staging was so dry that I almost fell asleep. One or two early scenes made me sleepy, but once the action picks up, it’s easy to get caught up in all of the craziness. In an ordinary play, this would be the director’s fault. But in Shakespeare Demystified, there is no director. The actors collectively take up this duty. The set was a bench sitting on top of a platform. The lights changed once, to set the tone for the final scene, which takes place at night. For most of the show, the lights were on and stayed on. The effect of such a setup is to focus our attention on the acting. It’s customary for a reviewer to call out an actor or two for an exceptional performance. So-and-so stood out in this or that role. So when I say that none of the actors stood out, it may sound like a bad thing. But it’s the opposite: it’s a compliment of the highest order. None of the actors drew attention to themselves by overshadowing other actors on-stage. Actors went on stage and did their jobs and exited. As the protagonist, it is Falstaff’s job to stand out. Falstaff is full of himself, literally and figuratively, and it would not suit the character to play it any other way. Qahar Aqilah plays Falstaff and he exaggerates his character, but the exaggeration is in the text. Other stray observations: Anne James (as Mistress Quickly) picking the lint and hair out of a measly pile of coins in her palm. Lim Soon Heng (as Master Ford) splashing water on his face from the basin where Falstaff was soaking his feet. Falstaff lustily grabbing the front of his belly when talking about his “good parts.” Sandee Chew and Marina Tan (as Mistress Page and Mistress Ford) tricking Falstaff into doing whatever they want him to do. These scenes reach pantomime levels of absurdity. Some literary critics think that it isn’t enough to call Shakespeare a literary genius. They say that we didn’t know what it meant to be human until Shakespeare came along. In the same way we devalue Shakespeare when we reduce his characters to mere words, we also do him a disservice when we put him up on a pedestal. Does Shakespeare have something to say? So, as Malaysians, does Shakespeare have something to say? Yes he does. And to find out what it is, we have to listen carefully. Because the rewards of reading Shakespeare are the rewards of all reading: we grow to know someone unlike ourselves, and through that knowledge we grow to know ourselves better. But in order to love the language, we have to hear it performed properly, which is why it was hard to hear David Lim deliver it. There is nothing inherently wrong with delivering lines with a Chinese accent, but the rhythms and sounds are different and it’s a great feat by Shakespeare that if you mess with the rhythm and the sound of his lines you change the meaning of them entirely. This article was amended on 10 May 2013. It originally referred to the Elizabethan era as “the previous century”. This has been corrected. See Tshiung Han edits and publishes New Village zines. The “last century” comment is a case of hyperbole. You’ll note that I’m adopting the tone of someone skeptical of Shakespeare throughout the review. The director comment was a way of talking about the way Shakespeare Demystified put together their productions. I’m sure it was clear to the “ordinary reader,” that I was making a distinction between plays with directors, “ordinary plays,” and plays without directors. It’s simplistic, but it served a purpose. As for your illustrations, “If we should stage a minimalist production in The Globe, should this qualify as a fault of the director?” Yes, it’s the director’s fault. It was also your fault for chopping off a third of that play. I was using the word “fault” to talk about responsibility and ownership over decisions. But maybe I should have used a more neutral word when doing so. “Qahar Aqilah plays Falstaff and he exaggerates his character, but the exaggeration is in the text.” First, You’ll notice that I was building an argument in the paragraph for how a performance that draws attention to itself is a lesser performance. But Falstaff is supposed to draw your attention. My comment was supposed to convey the idea that Qahar did what he was supposed to do. Second, it might seem like low praise to say that Qahar “exaggerates his character, but the exaggeration is in the text,” that I don’t seem to be giving the actor enough credit, but it isn’t the case. I’m intrigued by this distinction between characterisation that is “suggested,” but isn’t “contained” by the text. Because it seems like a slippery distinction. The suggestion of a thing is contained within the thing. Perhaps you are saying that without Qahar to reveal the character then Falstaff would be words on a page. I agree with you. And my original statement reflects that agreement. With respect, the last century was the 20th. Not the late-16th/early-17th. Moreover, Elizabethan English isn’t old. It’s Elizabethan. 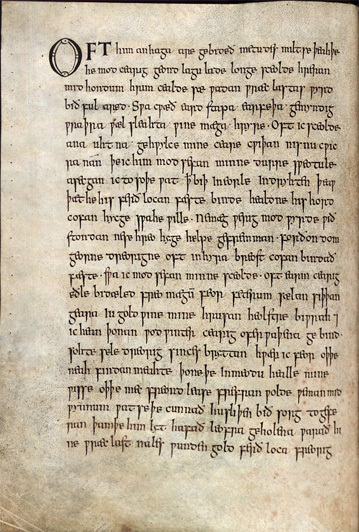 Old English looks like this: http://people.umass.edu/eng2/images/wanderer.jpg and sounds even stranger. It gets even older. This is an academic question and bears no reflection on the review: I am not sure what is meant by an ordinary play, or a fault is in this sense. If we should stage a minimalist production in The Globe, should this qualify as a fault of the director? I once chopped off a roughly third from a play’s run-time, which earnt me some opprobrium. I am not sure if I was right to do as I did, but I believe we generally put too much blame on directors (or, alternatively, actors). I must put it to you that the exaggeration is suggested by the text. It isn’t contained within it. Falstaff is an exaggerated (and very often a tragic) character, but it is up to the actor to play it thus or otherwise. I have not seen this production and cannot judge Qahar’s performance, but I should rather give the actor the credit for the portrayal than to suggest that he was an instrument of the text. Thank you for pointing out the error, U-En. It has been amended.